Account-based marketing or inbound marketing? Which one should you use? Well, maybe that's not the right way to think about it. As it turns out, the two strategies are actually pretty complementary when done well. With all the confusion between account-based marketing and inbound marketing, we thought we would clear the air -- and hopefully help show you how the two work together. To simplify it though, let's put it this way: Instead of marketing to individuals, ABM is about marketing to all decision makers within a target company at once. 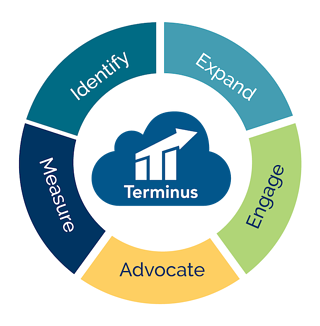 Here's a visual explanation from Terminus, an account-based marketing company. Are Inbound Marketing and Account-Based Marketing Antithetical? Because account-based marketing dictates targeting a specific company instead of attracting a wide range of individuals, it can be easy to assume that account-based marketing and inbound marketing are incompatible. But that's not true. Inbound and ABM can actually be used in conjunction with one another since they share a few core principles. Tight sales and marketing alignment. There are many natural points within the ABM process that foster a closer relationship between Sales and Marketing. Each team needs to work together to achieve company goals, and ABM brings marketers closer to Sales' thinking -- typically focused on accounts instead of leads. Highly targeted, personalized content. The cornerstone of ABM is focusing on specific individuals within an organization, and the content and messaging you send with ABM should be highly personalized and targeted to specific individuals within an account. Customer happiness, retention, and upsell. Because ABM zeroes in on a core set of specific accounts, focusing on those clients' happiness, retention, and potential to utilize more of your product/service through upselling can be a viable growth strategy. Inbound is about adapting to the way people want to shop and buy. Account-based marketing fits nicely into that philosophy in that it enables marketers and salespeople to take a thoroughly personalized approach to a handful of accounts. In a smaller addressable market, you can leverage ABM for your lead generation strategy, and lean on your online presence, content, and the influence you’ve built through inbound to close the deal. Where Do Inbound Marketing and Account-Based Marketing Diverge? So if the two approaches share a commitment to personalized, relevant content, how are they different? They diverge in two places. The first concerns scalability. Account-based approaches work well when you have a smaller addressable market. For example, if there are only 100 companies you can sell into because you offer a highly specialized or perhaps enterprise-level product, creating an individual marketing plan for each potential account is reasonable. But if your company sells to a wide and diverse market of thousands, account-based marketing is harder to scale. That's where you'd want to use a broader inbound approach. The second area the two practices diverge is in the channels and tactics they prioritize. Account-based marketing relies on outbound channels like email and targeted advertising. When done well these tactics can extend a personalized experience -- but if you're not careful, uninvited outbound tactics can become spammy and disruptive. When done poorly, ABM can start to resemble the spammy approaches inbound was set up to counter. How Can I Do Account-Based Marketing? To ensure you keep humans at the center of your account-based marketing strategy, stick to the principles. Make account-based marketing about tailoring the way you communicate with your target company and be wary of any tactics that may overwhelm them. There are five primary stages to account-based marketing that work hand-in-hand with inbound marketing. Let’s walk through each and detail how you can conduct ABM in a human-friendly way. Account-based marketing begins with Sales and Marketing identifying and selecting relevant accounts. When beginning this selection process, firmographic data, such as company size, number of employees, location, and annual revenue, can give you an understanding of accounts you may want to target. Similar to inbound marketing, you can also use buyer personas to understand the day-to-day lives and challenges of your target buyers, and then determine content and channels to approach them. In large sales -- where ABM is typically used -- buying decisions are generally made by numerous individuals within a company. ABM helps establish a relationship with each potential buyer and engages them in the purchase decision. At the expand stage, creating unique, company-specific content that interests each potential buyer within the organization is important. Whether your product is for marketers, operations leaders, or anyone else, ensuring that you identify and engage with everyone in the buying decision is crucial to winning a customer. Consider the challenges each of your stakeholders faces in order to create compelling content. For example, Finance may be concerned with pricing, while Operations might be focused on user access, ease of use, and security. With this context, you can create targeted content and interactions that match each individual's concerns and challenges. Here’s where Sales and Marketing come together and join the party to engage with stakeholders across various channels. For example, if one of your stakeholders prefers email, then equipping salespeople to reach out to that person with a helpful and relevant message can get a conversation started. This stage is largely about developing relationships with and getting to know all the buyers who will make the final decision. Next, you want to nurture bonds with a few stakeholders who can serve as advocates within the organization. The modern buyer is not looking for more information about products or services and can tune out information they don’t want to hear. So it’s up to both Marketing and Sales here to provide value -- and talk about the product when and where necessary. Finally, reporting at the account level can give you data on what's working, what's not, and how to improve over time. Within HubSpot, you can report on company growth, revenue, job titles, engagement levels, and much more -- all at the account level. So, where do you go from here? If you're a company that sells into a smaller addressable market and has its sights on a handful of highly critical accounts, you can learn more about building an ABM strategy without abandoning your inbound philosophy in this webinar.